2 Beds 1 / 1 / 0 Bath 1,258 Sq. ft. Description: Excellent location for lovely pueblo-style townhome. Two bedrooms, 1-3/4 baths with 1,258 sq ft. Great room has a cozy fireplace. Kitchen features a breakfast bar and island. Hot water heater replaced approx. 1 year ago. Roof tpo membrane 8 years, new shingles 2018. New stucco in 2018. Two-car attached garage. 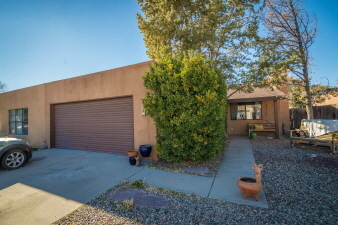 Walking distance to railrunner for easy commute to albuquerque. Close to all city conveniences.